Arts and Crafts furniture maker Gustav Stickley (1858-1942) was living in the Log House at Craftsman Farms at the same time he was writing and editing the popular magazine The Craftsman. 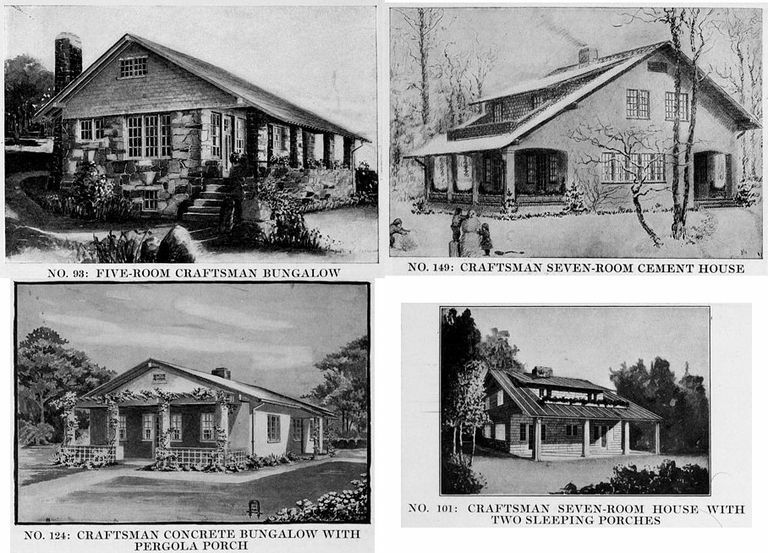 The monthly magazine became well-known for its free house plans and designs that became known as "Craftsman Bungalows." Here are four plans from the September 1916 issue. Today's architects talk about designing homes for the specific sites, for particular environments. Glen Murcutt follows the sun with his designs. They talk about using local construction materials. Shigeru Ban experiments with peg-held timber-frames. These are not 21st century ideas. The Craftsman design for this five-room bungalow was "planned for a hillside site at Larchmont, N.Y." according to the article. Larchmont, east of Yonkers in downstate New York, was a very rural community at the time of this article in 1916. The house is built with the stones and rocks blasted out to create the building lot. Shingle siding, typical of a Craftsman design, completes the upper half-story of the house. Other typical elements of Gustav Stickley's architecture include the porch along the entire front of the house—Stickley had an enclosed porch at his own farm— and the cozy "inglenook" off the sitting room. The inglenook here is even more isolated than the fireplace nook found in the No. 165 Craftsman House of Concrete and Shingles. Built-in seats and bookcases on either side of a huge fireplace are common features. The Craftsman home No. 149 is what we think of as a typical Craftsman bungalow. What we don't remember, however, is Stickley's fascination with the use of concrete, similar to what Frank Lloyd Wright was using at the same time. Wright's massive poured concrete Unity Temple was completed in 1908, built at the same time his famous plans for a fireproof concrete house ran in the Ladies' Home Journal magazine. One wonderful design touch of this particular plan includes the "sunken balcony with its little parapet" off the second-story dormer. It not only perpetuates Gustav Stickley's natural living values, but also provides "the exterior its air of quiet dignity and charm." So what is the front facade of a house like this? One might think it's the full-length porch side, like many other Craftsman bungalows. Yet, the entryway is from a "small corner porch" that provides a pathway directly to the upstairs, the kitchen, and "a glimpse of the hospitable fireplace" that pulls the visitor into the "large living room." With four bedrooms upstairs, the whole design could be described as traditional over the unexpected. The "sleeping porch" seems to be a great favorite of Gustav Stickley, especially prominent in his No. 121 Craftsman Summer Log Camp for Outdoor Sleeping, where the entire second story is as open as any porch. The Craftsman shingled house No. 101 has two sleeping porches on the second floor, but the design becomes more "all-weather" with the addition of walled bedrooms. The rustic, Arts and Crafts styling is sustained by all space revolving around the massive, stone fireplace and chimney in the center of the house. With plan No. 124, Arts and Crafts designer Gustav Stickley reminds us that no house is built in a vacuum. "In selecting this plan," he says, "the size and style of neighboring houses must be considered, as so low and small a dwelling would not appear to advantage unless buildings about it were fairly low and similar in style." The Craftsman has an idea for what a neighborhood should look like. "A pergola porch extends across the front of the house," continues the description, "and as the bungalow will probably be built near the street, we have suggested a parapet around the front porch and if this does not give sufficient privacy, flower boxes might also be placed between the pillars." But don't use "turned wood or cement" for those porch columns. "We suggest hewn logs to support the pergola beams," Stickley recommends, "as these will give a more informal appearance." 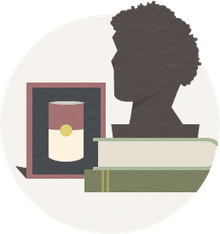 What are The Craftsman values? Natural in materials, simplicity in design, and culturally-oriented spaces, planned with "plenty of room for piano, bookcase and desk."